PICMET (Portland International Conference on Management of Engineering and Technology) was established in 1989 as a non-profit organization to disseminate information on technology management through an international conference. It is governed by a Board	of Directors and an Executive Committee. The Advisory Council provides advice and counsel on the global issues and critical dimensions of technology management and assists the president in the selection of key speakers. Advisory Council members deliver plenary speeches at the Conference. 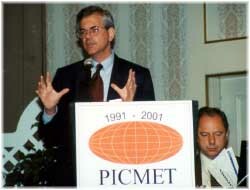 The first PICMET was held as PICMET’91 in Portland, Oregon in October 1991. The theme was “Technology Management: The New International Language”. Approximately 400 attendees from about 30 countries attended PICMET’91. Initially there was no plan to make PICMET a continuous conference but the success of PICMET’91 and requests from researchers and practitioners of technology management from around the world prompted the Board of Directors to repeat it as a biennial conference to be held in Portland during the last week of July in odd-numbered years. Since 2004, PICMET has became an annual conference held at different locations in the world.